Why Albums Are Released On Tuesdays In The U.S. : The Record No one seems to know why the Tuesday tradition started. But this is why all other days don't work. 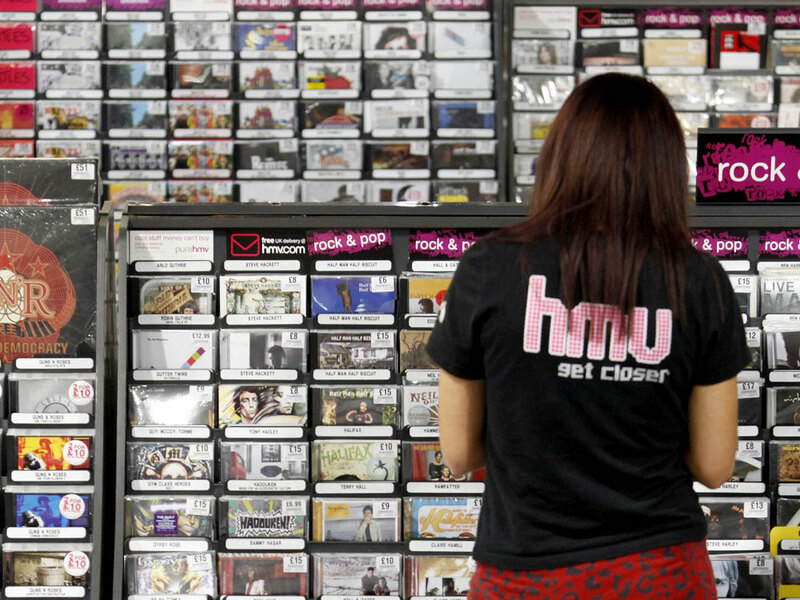 An HMV employee stocks shelves in London on a Monday, which is release day in the U.K. So why is it Tuesday in the U.S.? Honestly, no one seems to know for sure. It's more like a tradition with murky origins. And it happens on Tuesday in the U.S. only — in the U.K. and France release dates are Mondays, in Germany it's Friday. So if Tuesday isn't the universally accepted best day to offer new music to customers and there's no law or grand business wisdom about it, why does everyone put out albums on the same day? One explanation is Billboard magazine, which publishes its charts on Wednesdays. If you release an album on a Tuesday, then you get the maximum seven days of sales counted toward your total (including a full weekend). The other is inertia — distributors are all set up to shuttle stock out to stores over the weekend and on Mondays. Most only do runs a couple of times a week. So "New Music Tuesdays" has seeped into popular culture. We wanted clearer answers so we've been asking around this week — and everyone is giving us different answers. The one explanation people share is a hazy recollection of something happening before Billboard (so, pre-1950s). They just don't remember what that was. Monday: If stores are told to begin selling CDs on Mondays, distributors need to ship them by Sunday, and stores need to pay staff to unpack, inventory and stock over the weekend. That is a bummer. Also, Monday is a government holiday more than any other day of the week. Wednesday: Stores and musicians can tell people the new CD is available to buy in the middle of the week, but it usually takes a bit for people to motivate themselves on over to their local record store. By Wednesday the week is almost over (I wish). Thursday: For the reason above, Thursday is more too late. Friday: Even more too late. But it is payday. Saturday: It's harder to get press coverage that people see on the weekend. Sunday: Who goes to record stores on Sunday? Got any other theories as to why Tuesday became release day?